Tapeworm infection occurs when your child ingests the egg or larvae of a tapeworm. There are three types of tapeworms that commonly affect humans. They are found in beef, fish and pork. The larvae of beef and fish tapeworms are often directly ingested by eating undercooked, contaminated meat. This differs from pork tapeworm eggs, which are spread through food and water sources that have been contaminated with the feces of infected pigs. Ingested beef and fish tapeworm larvae attach inside the intestine, where they feed and grow. In contrast, pork tapeworm eggs grow into larvae inside the intestines and then migrate to other tissues in the body, where they form cysts. Be on the lookout for stomach symptoms like nausea, poor appetite and diarrhea if you suspect that your child has been exposed to larvae tapeworms. In many cases, however, parents are unaware an exposure has occurred; in this case, the first sign is the appearance of a portion of a worm moving in your child's stool. Reassure your child if this happens. Dispose of her diaper or flush the stool and help her cleanse her bottom with a wet wipe. Wash your hands thoroughly with soap and water, and have your child do the same. Contact your child's health care provider and make an appointment. You may be instructed to collect a stool specimen and bring it with you to the appointment. Discuss the purpose of a stool sample with your child. Explain that it's important that the sample not come into contact with urine or toilet water. When he feels the need to have a bowel movement, ask him to empty his bladder first, then place plastic wrap loosely across the rim of the toilet. Put the seat down over the plastic wrap to hold it in place. Ask your child to go to the bathroom on the plastic, and provide him with time and privacy, if needed. Put on a pair of clean latex gloves. Remove the plastic wrap and allow your child to finish as usual. Place the sample into a clean, dry plastic jar with a screw-on lid, being careful not to contaminate the outside of the container. Remove gloves and wash your hands. Refrigerate the sample until it's time to leave for your child's appointment. Go to your child's doctor appointment and provide them with the stool sample, if one was requested. Describe any possible tapeworm exposure and your child's symptoms. The most common treatment for an intestinal tapeworm infection is oral medication. The choice of medication depends on the type of tapeworm that your child has. With proper treatment, intestinal tapeworm infections are typically resolved without complications. Avoid reinfection by practicing good hygiene and thorough hand-washing habits. Follow up on any instructions given by your doctor. For example, follow-up stool samples are often requested to ensure that the medication was effective. Report any potential exposure to tapeworm-contaminated water or food to your child's health care provider promptly. Because these eggs hatch in the intestine, migrate to different areas of the body and form cysts, you may see a variety of presenting symptoms. Report seizures, neurological symptoms, fevers, lumps and bacterial infections immediately, and seek medical attention. 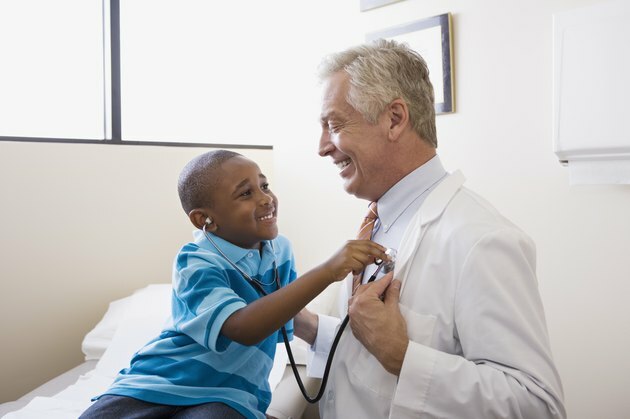 Take your child to the doctor and reassure her during exams and tests. Provide comfort during blood tests if they are needed to determine the presence of invasive tapeworms. Explain any other diagnostic tests that may be utilized to determine the location and size of cysts, such as ultrasounds, CT scans and MRI scans. Administer medications as prescribed by your child's health care provider. Continue to provide support throughout medical treatment. Both medical approaches and surgical approaches may be indicated, depending on which area of the body effected and the location of any cysts. What Happens if My Child Swallows a Coin?